World War II was a classic period in the development and perfection of propeller-driven aircraft. Built during the crisis of wartime, these aircraft and the cockpits within them were marvels of technology, ingenuity and design. Cockpit is the first book that puts the reader into the pilot's seat of these superb classic aircraft. Creature comforts were non-existent. The only thing that separated the pilot from the environment at 30,000 feet was a thin sheet of aluminum and glass. This book shows us what we can no longer see. The cluttered, claustrophobic cockpit was not designed for comfort. It was a cold and lonely place, as this book clearly illustrates with text and beautiful photographs. Many pilot perspectives included. 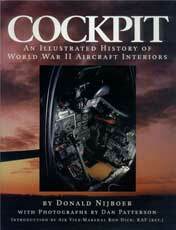 Cockpit is rich in historical photographs of the insides of dozens of the most celebrated, and feared, aircraft--American, British, Japanese, Russian and German. Cockpit book: 170 pgs, hardbound w/dust jacket, 9.25 x 12, 100+ photos, many in color.